Wellllll, don’t know if you’ve noticed – anyone out there still reading – but I’ve been a bit silent the last few months. Don’t worry I haven’t abandoned you, I’m just pregnant (!) and have been throwing up constantly for months. I didn’t think anyone really needed a recipe for avocado and/or vegemite on saladas, which was pretty much all I ate for three months, and on top of that my toddler has decided she doesn’t NEED a nap anymore so my time for blogging has been limited. 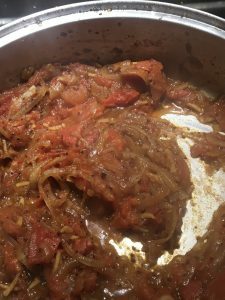 But here I am with a recipe I’ve been meaning to share with you for about six months. 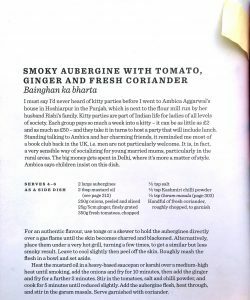 This is a variation on a recipe from Rick Stein’s India, a book that my parents have. I’m writing this up here partly because every time I make it I have to refer to a crappy photo of the page I took on my phone. It works as a meal in itself or as a dish in a group of small dishes and is great both hot and cold. The original recipe calls for mustard oil rather than oil and mustard, but it’s not always easy to lay your hands on at the last minute so I tend to do this as below because I can’t always be bothered wrangling my kid around extra shops to get specialty ingredients. If you really don’t like coriander this works beautifully with mint too. 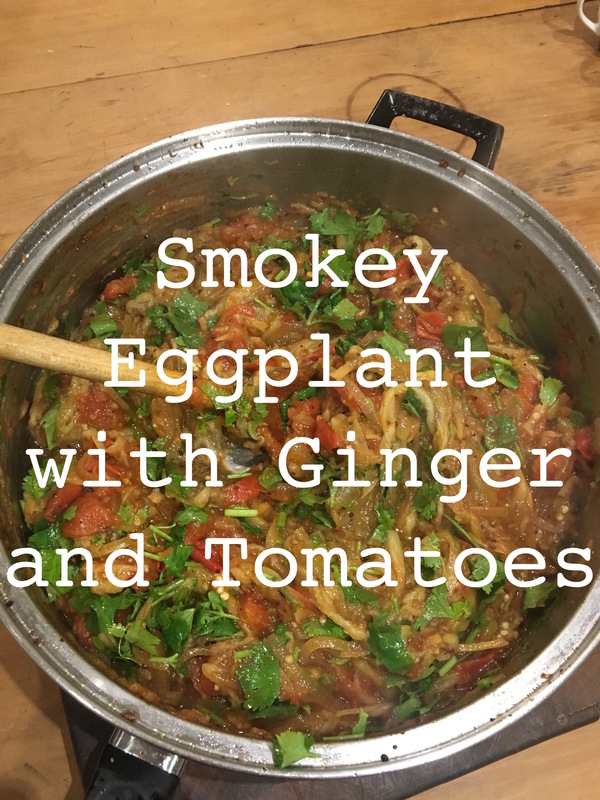 First, the eggplants – leave them whole and char the skins to get that smokey flavour. I recommend doing this on the barbecue if you can because doing it inside is messy and smokey. If you have to do it inside do it directly over the gas flame on the stove, or as a last resort under the griller*. They should be soft and cooked on the inside and blackened on the outside when done. Pop aside in a bowl until they’re cool enough to handle then peel the skin off and discard. When you’re peeling the eggplants try to keep any juice that runs out of them. Mash the eggplant a bit with a fork. Heat the oil and the mustard together in a wide, high sided pan, stirring as it heats. When the oil is hot and the mustard seeds start popping get the onions in ASAP, otherwise you and your kitchen will be covered in boiling hot, exploding mustard seeds. 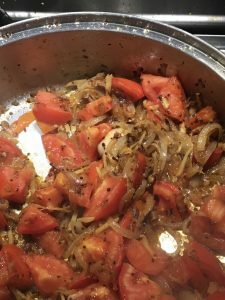 Cook onions at a medium/medium high heat until they’re browning but not in danger of burning – about 10 minutes – then add the ginger and the cumin seeds and cook for another two minutes. Add the tomatoes, salt and chilli powder if using and cook until the tomatoes break down – 5 to 10 minutes. Add the eggplant flesh and heat through. Garnish with, or stir through, a good handful or two of coriander. My preference for this is to serve it with really nice homemade wholemeal bread but it’s also great with brown rice or whatever carb is your preference. *I’ve got opinions about modern grillers. A griller used to be a separate, functional kitchen tool that is now a useless oven function and it makes me cross that consequently a generation of children have grown up only knowing cheese on toast as something that comes out of a sandwich press. The cheese doesn’t bubble right! !